It is estimated that the Information and Communications Technology (ICT) sector worldwide is responsible for around 2 per cent of global CO2 emissions. India has around 700,000 Solar Telecom Towers around the country, a large portion of which is not connected to the electricity grid. Another large portion does not have access to reliable electricity implying they have to install backup power systems in order to run without interruptions. 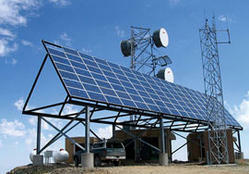 Diesel Generators have been the choice of telecom operators despite their high carbon imprint. This is because of the ease of buying and installing diesel Generators. Usage of more than 4 billion liters of diesel every year, have brought this sector under the government scanner. Telecom Ministry has accepted most of the recommendations given by TRAI on promoting energy efficient technologies and reducing carbon emissions in the fast growing telecom sector. Efforts to bring down carbon emissions and encouraging environment-friendly technologies is generally referred to as approach towards green telecommunications. Total Co2 emissions from tower annually in India is equal 10.2 million tons.